Display your favorite decorative pillow covers with this throw pillow insert. Featuring a high-fiber polyester cover to prevent leaks, this pillow is stuffed with a blend of down and feathers for a plush feel. I bought two 24 inch pillows. I am very satisfied with the amount of feathers - they are very thick and full of feathers. Understand that these are mostly feathers (with only a small amount of down) so are somewhat prickly. The pillow covering is a thinner fabric but very closely woven so the feathers shouldn't poke through. 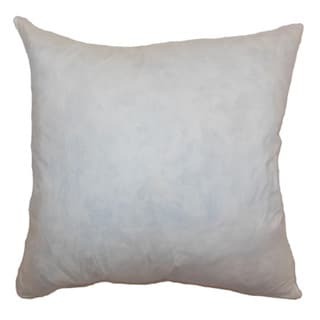 I bought two 20 inch pillows from another company on Overstock called Downlite and I like the Downlite pillow much better - they are much softer even though they are also feather pillows; but Downlite didn't have the 24 inch pillows that I wanted. I am satisfied with these Pillow Connection pillows for use on my sofa, they are what they state: feather pillows, but I do prefer the Downlite pillows. Exactly what I needed for custom made throw pillow cases. Although only a small amount of down, works just fine for me and the price was right. Great pillow insert! I used it for another pillow cover rather than for the 20x20 pillow cover I just bought, because it didn't fill the cover as full or to the corners as I expected. This pillow worked well in the Cotton Linen Pillow Cases that I also ordered. They are down filled, very full, and fit well in the 18X18 Pillow case. I don't know what else you could expect from a pillow insert. they are the right density of fill. Soft but firm to the touch. I'd buy again. I ordered three 24 x 24 size pillows. These seemed smaller and were not as fluffy as I preferred. The only positive thing I can say about these pillows is that they are in fact stuffed with feathers - duck feathers. The pillows are heavy and flatten easily. They are not at all fluffy. The stems of the feathers are very prominent, like putting your head on a bunch of little twigs. I have other inexpensive feather/down pillows that look and feel much better than these, same mix of feather to down but goose, not duck and in a cotton case, not polyester. Very, very nice pillow insert. It was some weight to it ~ not one of those loose filled down inserts. Well worth the price. I had a cover made for it, and the overall effect is fantastic. High quality inserts for an excellent price. You can't go wrong! I recommend ordering the next size up if you like a full, dense pillow. I ordered 20" square inserts for my PB 18" covers and the fit is just perfect. Love! This pillow insert is actually only 5% duck down. The other 95% is duck feathers. The title (name) of this item is misleading. Nonetheless, it's more comfortable than polyester pillow insert. Love the pillow can’t wait for the cover to arrive. Very nice pillow insert. Fluffy and nice size to fit in pillow cover. These pillow inserts are perfect if you like fluffy down. You can feel the "stems" of the feathers through the fabric but if you are putting this insert inside a case made with a heavier fabric, it's fine, and a great bargain. True to size, these plump pillows are great with pretty covers also purchased from Overstock. Wonderful, large, and luxurious to lean on! Great fluffy pillow, perfect for the decorative cover I had previously purchased. "What size are these pillows"
"Can you create the "karate chop" look with these pillow inserts? Thanks!" Yes. However, pillow cover can't be "too tight" for insert to fold when "dressed", so be sure it has a bit looser fit to give the insert room to be chopped! to fill the covers I bought with the durability needed.